Two great textural flowers for bouquets are stock and dahlias. We LOVE to use them whenever we can. They both come in a variety of colors, making them easy to use with any most color schemes. 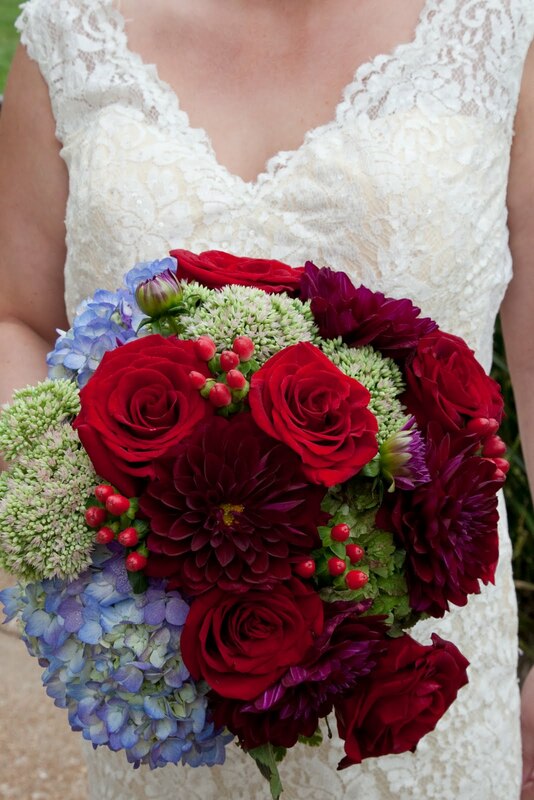 Dahlias and stock really give an added interest to any bouquet because they are not typically thought of as traditional bouquet flowers. It has a strange name, but is a really versatile flower. 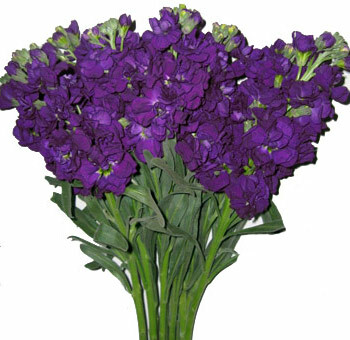 We use it to bulk out a bouquet and give it some base. 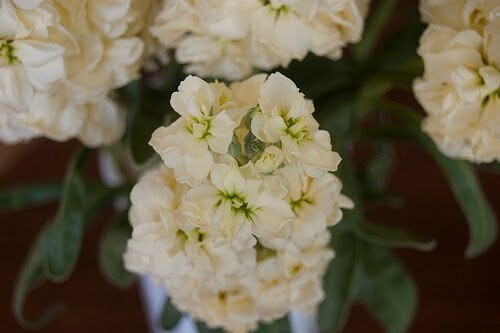 It is available all year round and has a sweet fragrance. It comes in purple, lavender, white, butter yellow, hot pink, and antique peach. Here are a couple of photos we pulled from the web of purple and white stock. They are very full flowers that mimic the same texture as hydrangea. 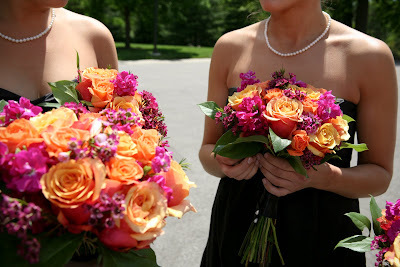 The following picture is of bridesmaids’ bouquets that include hot pink stock. We did these arrangements in late spring/early summer and the colors really popped! The hot pink stock peeks out between the orange roses and dark pink filler. These lush blooms are very interesting to work with. There are so many color varieties ranging from reds to oranges, shades of pinks and purples, yellows, and even whites and ivories. They are available most readily in late summer and fall, but have been known to pop up in early summer and as late as December. Again, dahlias are a great flower to give a bouquet some fullness and a unique texture quality. 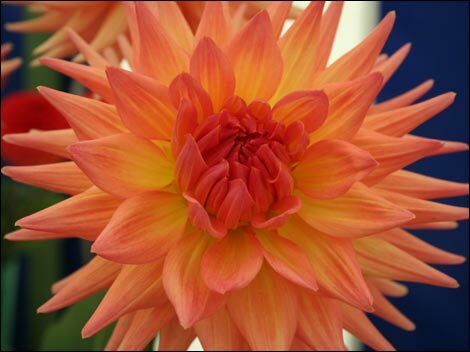 These dahlia photos show a wide variety of color and shape. 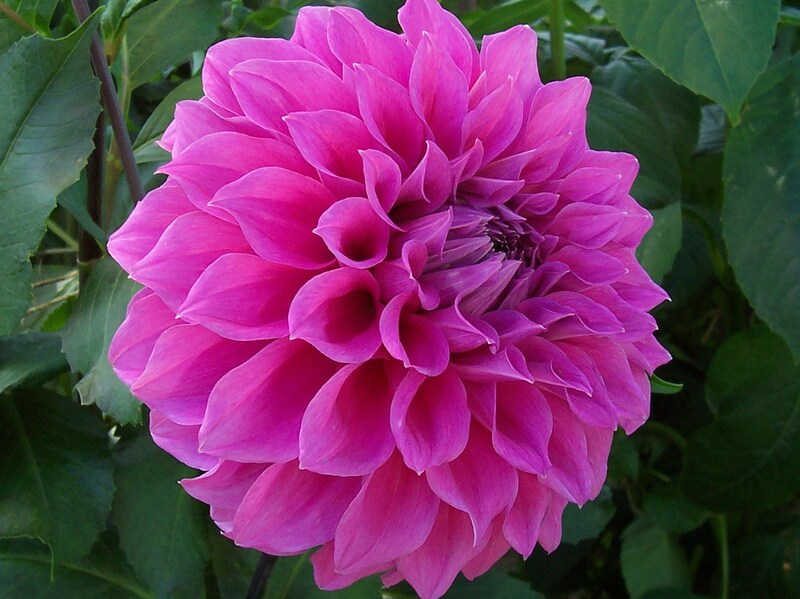 Dahlias are similar in size to gerber daisies, but are more round and full looking. Here is an example of how we used dahlias in a bridal bouquet. The burgundy blooms contrast in texture next to the roses, berries, sedum, and hydrangea, but the deep color blends well with it’s surrounding flowers. Just two suggestions when choosing wedding flowers. 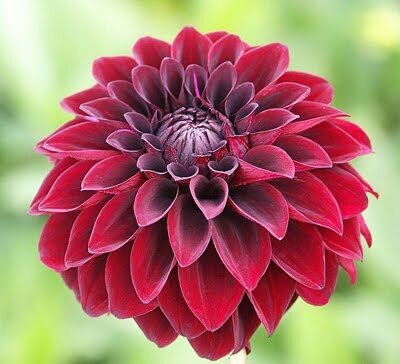 If you are looking for something a little more unusual to give your flowers a unique look, consider dahlias and/or stock. Both are cost effective and easy to incorporate!